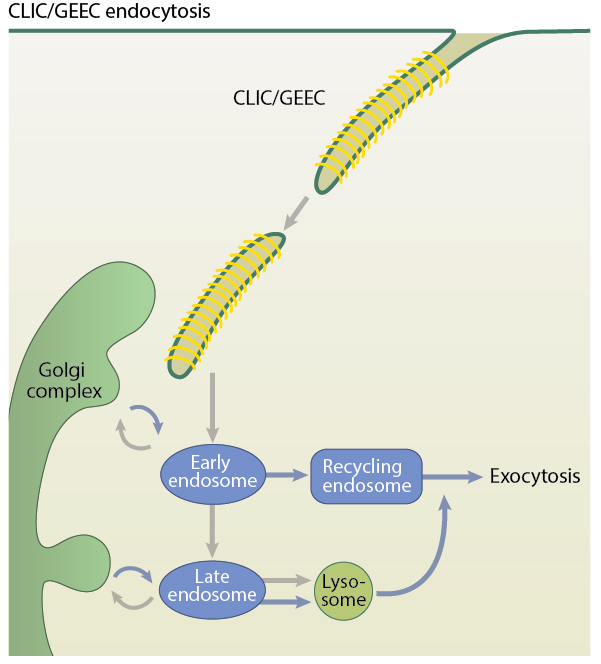 The CLIC/GEEC (CG) pathway is a clathrin-independent endocytic pathway mediated by uncoated tubulovesicular primary carriers called clathrin-independent carriers (CLICs) which arise directly from the plasma membrane and later mature into tubular early endocytic compartments called Glycosylphosphotidylinositol- anchored protein (GPI-AP) enriched compartments (GEECs). The GEECs then fuse with sorting endosomes in a Rab5 and PI3K dependent manner . This endocytic pathway was first identified for its selective internalization of various GPI-APs like the folate receptor, in a manner independent of clathrin, caveolae and dynamin, and regulated by the Rho family GTPase Cdc42 . Apart from endocytosis of GPI-APs, the CG pathway also facilitates the endocytosis of transmembrane proteins like CD44, dysferlin (reviewed in ) as well as entry of cholera toxin binding subunit, the vacuolating toxins aerolysin and VacA, and bulk fluid and membrane , , . The CG pathway is a pinocytic pathway that accounts for the major uptake of fluid and bulk membrane in fibroblasts and is therefore a major contributor to membrane dynamics. About 40% of the endocytosed fluid is regurgitated within 5 minutes, quickly returning significant portions of the internalized plasma membrane and enabling rapid membrane turnover for key cellular processes like plasma membrane repair and homeostasis . In mouse embryonic fibroblasts, the entire membrane area is recycled in less than 15 minutes via the CG pathway . The CG pathway may play a role in repair of plasma membrane lesions induced by bacterial toxins by rapidly removing the toxin from the membrane through endocytosis. This is observed in the case of bacterial streptolysin O toxin (SLO) induced PM lesions. Also, dysferlin, a protein that regulates membrane fusion for muscle repair is found to associate with CLICs, further pointing to a role for the CG pathway in membrane repair (reviewed in ). 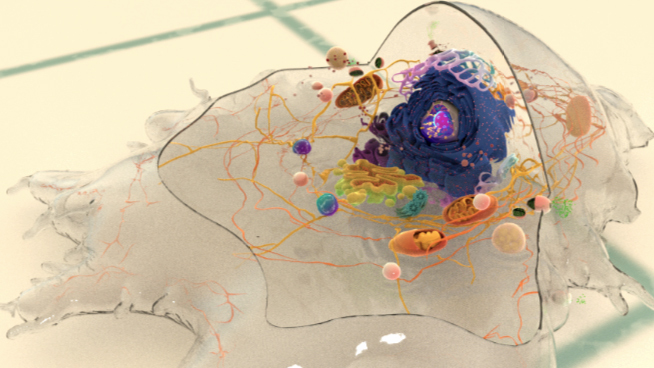 At the plasma membrane, GPI-APs are organized into cholesterol-dependent nanoscale clusters which are formed by the activity of cortical actin . Indeed, cholesterol sensitive Cdc42-based recruitment of actin polymerization machinery is critical for the CG pathway . Cdc42 dynamics at the plasma membrane, cycling between active (GTP-bound) and inactive (GDP-bound) states, is required for the recruitment of actin polymerization machinery in the CG pathway. Regulation of Cdc42 dynamics is initiated by GBF1, an Arf1 guanine nucleotide exchange factor (GEF) that activates Arf1  ]. The activated Arf1 protein recruits a Rho GTPase activating protein (ARHGAP10), which inactivates Cdc42 and returns Cdc42 to its cycling state. Another regulator of Cdc42 and the CLIC/GEEC pathway is the GTPase Regulator Associated with Focal Adhesion Kinase-1 (GRAF1), which contains a RhoGAP domain that can inactivate Cdc42, a BAR domain and an SH3 domain . Although dynamin is not required for vesicle budding in CLIC/GEEC pathway, it is seen to associate with the vesicles, post internalization (reviewed in ).